The following pages are written in the interest of preserving some of the historical value of Operation Giant Slingshot. 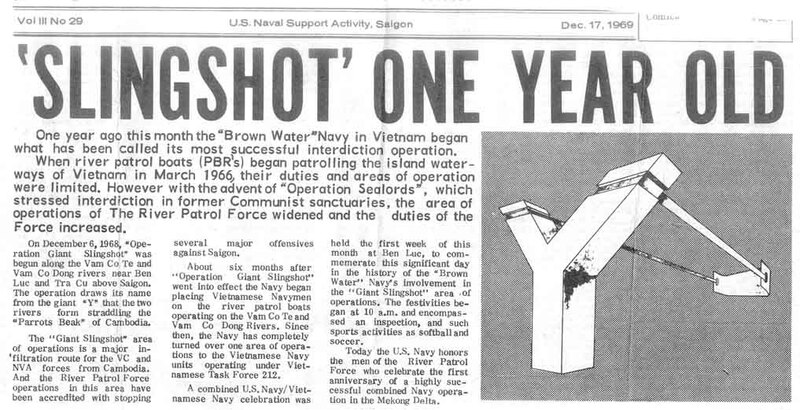 The success of the operation is a tribute to the skill of the American sailor and later his Vietnamese counterpart. This highly successful venture in Vietnamization is a credit to all those who participated. Without everyone's full support, including that of our seniors, the progress made could never have been realized. I would like to extend my particular thanks to my staff and especially to LT JAMES A. HOUGH and LTJG RICHARD J. COLLINS for their contribution and unselfish effort in the documentation of this chapter of Riverine Warfare in Naval History. I want to extend my gratitude to the tireless efforts of my good friend, Albert E. Moore, President of the Mobile Riverine Force Association, in getting this historical Naval document typed up for the internet. I'm extremely proud that we are able to add this important document to my web site for all to see. Thanks Al, you're a champ!! Webmaster's Note: I received the following email that I thought was interesting. Thanks Rick. "I ran across your web site, and thought I'd give you some information regarding Operation Giant Slingshot. I arrived in Ben Luc in May, 1969. I bunked onboard the YR9 until the Sea Bees got some of the hooches built. I eventually ended up living on a nice corner lot, next door to the Seals. I ended up as a watch-stander in the NOC on the YR9, where eventually I became a watch supervisor. Lt. Hough was our boss, and Cdr. Sigmond was our C.O. Both were good guys. Cdr. Sigmund was from Cleveland, as was I, and we talked about home more than once. The Giant Slingshot pin that is shown in a photo on your site was a designed by me. Cdr. Sigmund asked everyone to submit a design for a unit pin, and he picked mine as the winner. He had someone find a place in Saigon that made them.